The following is an overview of the factual data presented by the NTSB on the second day of their investigation. During the media briefing on the second day of the NTSB investigation of the crash of SpaceShipTwo, acting NTSB chair Christopher A. Hart, reported on some of their early findings that implied that there was no fire, explosion, or other kind of breach or failure involving the engine, fuel tank, or oxidizer tank. Early evidence instead points to an un uncommanded deployment of the feathering system just prior to the loss of telemetry from SpaceShipTwo. The feathering system on SpaceShipTwo allows the twin booms on the vehicle, referred to as the feathers, to rotate upward in order to provide more aerodynamic drag on reentry. They are intended to be deployed after the engine has shut down and prior to reentry. According the information provided at the briefing, deploying the feathers takes two actions from the flight crew. The feathering system has to first be unlocked before they can be deployed by moving the feather handle into the feathered position. There is a feathering handle that moves the feathers into the feathered position. Based on video evidence from inside SpaceShipTwo, the copilot unlocked the system, but the system deployed without any crew input. After being released from its carrier aircraft, the crew of SpaceShipTwo ignited the rocket engine. About nine seconds after engine ignition, telemetry data showed that the feather parameters changed from locked to unlocked. Video from the cockpit showed that the copilot had unlocked the feathering system, and is consistent with the telemetry data. About two seconds later, the feathers moved toward the deployed position even though the feather handle had not been moved into the feather position. The feather deployment occurred at a speed just above Mach 1. Shortly after feathering occurred, video data and telemetry data terminated. The engine burn was normal prior to the deployment of the feathers. Normal procedures would have had the crew unlocking the feathering system at a speed of about Mach 1.4. Unlocking the feathering system alone should not have allowed the feathers to deploy. The inflight breakup of the vehicle began sometime after telemetry ceased. 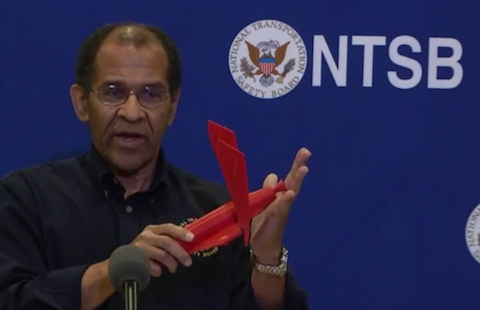 The NTSB has not determined if the inflight breakup was caused by aerodynamic forces or from some other cause. The rocket engine, fuel tank, or oxidizer tank showed no evidence of a breach or burn through consistent with some sort of fire, explosion or structural failure affecting those components. 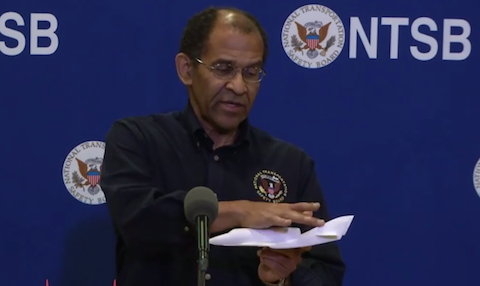 The NTSB emphasized that their statements were statements of fact rather than a determination of a cause of the mishap. Below is a video of the third media briefing. Note: An earlier version of this story inadvertently stated that there was evidence of a breach or burn on some components.